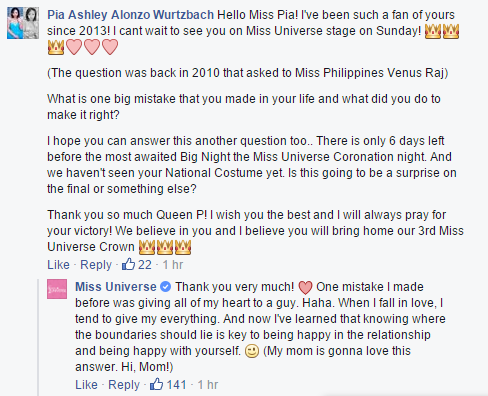 Earlier on Wednesday, December 16, it was Miss Philippines Pia Wurtzbach's turn to answer questions from the fans using the Miss Universe Official Facebook page. For an hour, she threw responses to both pageant and personal questions. It was clearly a test of how articulate the Filipina bet can be and she did not disappoint. She shared her thoughts about terrorism and why life is unfair. Pia also talked about the things that make her blush, to choosing between true love and the Miss Universe crown, and if she believes in... "forever". Below are screenshots of some of the questions and her responses. The Miss Universe coronation night is scheduled on Sunday, December 20 (morning of December 21st in Manila) while the preliminary contests are to be streamed live early morning tomorrow, December 17, on www.missuniverse.com.